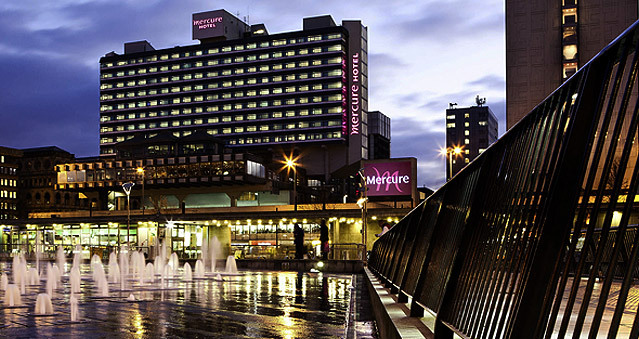 Visit the 4-star Mercure Manchester Piccadilly Hotel for a vibrant hotel overlooking the city centre. This Manchester hotel offers complimentary high-speed WIFI and freeview TV in all of the 280 chic guest rooms. The 10 fully equipped meeting rooms can welcome large conference groups for teambuilding events and the 800-capacity International Suite makes a grand venue for your event. The Brasserie is The Mercure Piccadilly’s individually styled restaurant offering a wide selection of internationally inspired dishes. These range from quick snacks to three course meals and are complemented by a range of fine wines from around the world. This city centre venue is perfect to host any number of teambuilding activities from The Killing, Around the World, Awakening the Dead, Stocks in the City, Mixology, The Ultimate Team Build to Get in the Zone, Real Life Clu’Doo, Escape the Box and many more. Location: The hotel is ½ a mile from Manchester Piccadilly railway station (12 minutes walking distance or 5 minutes taxi ride) and the MEN Arena. Manchester Airport is 9 miles away.